This is a simple, delicious vegetable stock that you can make into many meals or enjoy plain. 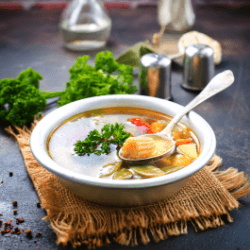 There are many dishes you can get out of this healthy and tasty stock! Throw washed veggies in a large stock pot and fill with water enough to cover all the contents. Add salt and pepper, cover and bring to a boil. Boil for 5 minutes and then reduce heat to medium-low. Simmer for 30-45 minutes covered. Turn heat off and cool. Strain through a mesh colander into a large pitcher or storage container and keep in the fridge for approximately 2 weeks. You can also freeze in individual one quart bags (4 cups for each) for convenience and accessibility when cooking. Use as a soup base, or to cook with your grains for more flavor and nutrition.